The Persian Gulf War, or simply the Gulf War, also known as the First Gulf War (August 2nd, 1990 - February 28th, 1991) was a United Nations-authorized military conflict between Iraq and a coalition force from 34 nations commissioned with expelling Iraqi forces from Kuwait after Iraq's occupation and annexation of Kuwait in August 1990. Though there were nearly three dozen member states of the coalition, the overwhelming majority of the military forces participating were from the United States, with Saudi Arabia, the United Kingdom and Egypt as leading contributors, in that order. 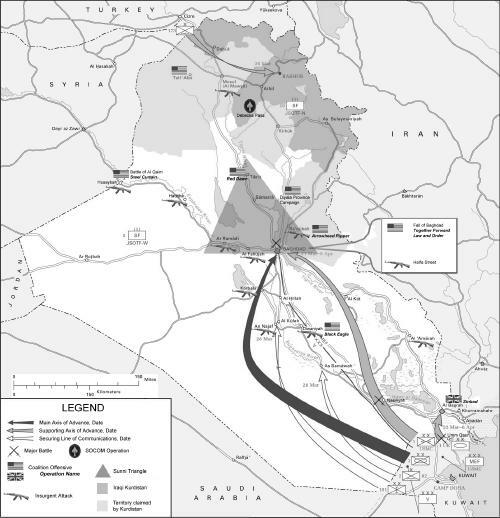 The Iraq War, also known as the Second Persian Gulf War, the Occupation of Iraq, or Operation Iraqi Freedom, is an ongoing military campaign which began on March 20th, 2003 with the invasion of Iraq by a multinational force now led by and composed almost entirely of troops from the United States and United Kingdom. The War in Afghanistan is an ongoing coalition conflict which began on October 7th, 2001, as the US military's Operation Enduring Freedom (OEF) that was launched, along with the British military, in response to the September 11th, 2001 attacks on the US. The UK has, since 2002, led its own military operation, Operation Herrick, as part of the same war in Afghanistan. The character of the war evolved from a violent struggle against Al-Qaeda and its Taliban supporters to a complex counterinsurgency effort.